Regularly these days a global report is released revealing that one or more Canadian cities has made the world’s list of Top 10 places to live. I admit that I can’t help feeling just a twinge of pride when I hear the latest news. 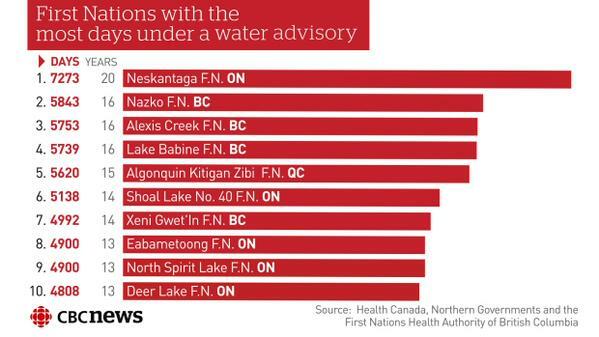 A CBC News report last week revealed that 70 aboriginal communities in northern Ontario have had to deal with unsafe drinking water over the past decade. That news reminded me of Pikangikum, the community I last wrote about in December 2014. Once called the suicide capital of the world, it was the subject of a coroner’s report in 2011, which made 100 recommendations to try to end the epidemic of young people killing themselves. While many specific programs and services have been promised by various governments in response to the coroner’s report, and some delivered, it is incredible to see how the basics lag – as in the case of drinking water. For example, it’s been reported that a volunteer group began installing water systems in Pikangikum’s houses in 2015, but had to stop after completing just 10 because the diesel-based electricity supply couldn’t handle the additional load of water pumps and heaters. The nearest transmission line is just 100 km from the community, which hardly seems an insurmountable obstacle for a country of Canada’s calibre. Many indigenous Canadians and their supporters are hoping things will change under the new Liberal government. Time will tell. This entry was posted in Aboriginal, Canada, First Nations, Indigenous Peoples and tagged indigenous peoples canada, indigenous youth suicide, Pikangikum, remote indigenous communities, water by martylogan. Bookmark the permalink.